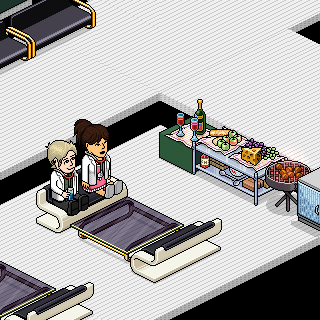 Staff wearing this identification badge are a Habbo Memorial Hospital Clerk. Clerks manage paperwork, patient records, admission and discharge. The modern Pharmacist, at your service. Dedicated to the person I love the most. I was enchanted to meet you. Taken in this room on 29 November 2018 and received 0 likes. Taken in this room on 25 November 2018 and received 1 likes. Taken in this room on 11 November 2018 and received 2 likes. Taken in this room on 9 November 2018 and received 2 likes. Taken in this room on 31 October 2018 and received 1 likes. Taken in this room on 23 October 2018 and received 3 likes. Taken in this room on 21 October 2018 and received 0 likes. Taken in this room on 15 October 2018 and received 5 likes. Taken in this room on 2 October 2018 and received 2 likes. Taken in this room on 12 September 2018 and received 3 likes. Taken in this room on 12 September 2018 and received 2 likes. Taken in this room on 6 September 2018 and received 3 likes. Taken in this room on 24 August 2018 and received 2 likes. Taken in this room on 11 August 2018 and received 0 likes. Taken in this room on 12 May 2018 and received 2 likes. Taken in this room on 4 May 2018 and received 1 likes. Taken in this room on 13 April 2018 and received 4 likes. Taken in this room on 6 April 2018 and received 5 likes. Taken in this room on 25 February 2018 and received 3 likes. Taken in this room on 15 February 2018 and received 2 likes. Taken in this room on 15 February 2018 and received 1 likes. Taken in this room on 15 February 2018 and received 0 likes. Taken in this room on 14 February 2018 and received 1 likes. Taken in this room on 12 February 2018 and received 1 likes. Taken in this room on 11 February 2018 and received 1 likes. Taken in this room on 27 January 2018 and received 7 likes. Taken in this room on 1 April 2016 and received 3 likes.